If you’ve ever had rat issue in your home, then you know how stressful and unsettling it can feel to have these unwanted guests in your space. At the first sign of rat poop or other rodent activity in your home, you should be planning which natural rat repellent technique will stop them in their tracks. There are many options for you to get rid of rats naturally without having to use poison or other methods that may cause damage to you or your home. Whether the rat infestation is coming from your backyard and you want to stop it from spreading, or these rodents are already inside, and you need them out, these home remedies can help. 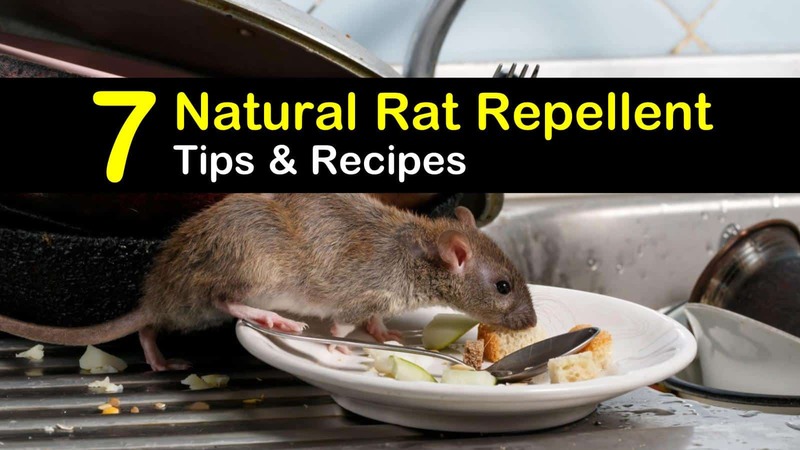 The natural repellent tips and recipes in this list are based on an understanding of how rats behave. We’ll let you know what to do to make your home less appealing to these pests, and how to scare them off if they’ve already settled. If there is rodent activity in your house, then this rat repellent will be helpful, as mice and rats can’t stand the way ammonia smells. However, while it includes natural ingredients, it might not be the right choice for homes with small dogs or other pets. Pour the ammonia and vinegar in a spray bottle and mix well. Spray the mouse repellent anywhere you’ve detected activity or in any areas where there may be entry points into your house. Alternatively, if you don’t have time to go around spraying, you can spray cotton balls with the mixture and leave them in areas around the house. If you choose the cotton balls, replace them every two weeks. Be careful when you are making and using this rat control spray, as high concentrations of ammonia may be irritating to your eyes and skin. One of the most natural ways to solve your rat problem is to trick the rodents into think there is a predator nearby. However, this may not be the best option to get rid of rats if they’ve already made it inside the house – obviously, urine doesn’t smell great, so this is better as an outdoor solution. Coyote urine is the best option, and you can buy it at hardware stores or online. Some companies sell products specifically for indoor use that are designed for placement in basements, under sinks, and around other places rats love. If you’re looking for a natural rat repellent that is eco-friendly and will leave your house smelling great, then essential oils are perfect for you. While this method might sound far-fetched, there is scientific research to back up its potential (..). Many essential oils double as methods to repel insects and other pests. For instance, peppermint oil can also keep mice away naturally. If you prefer not to make your own mixture, you can buy Rat Magic, an essential oil-based repellent for outdoor use. These humane methods of repelling rodents are welcome because success doesn’t involve having to search for dead rat carcasses as you would have to with poisons. There’s nothing worse than the smell of a dead rat decomposing in your walls, and you can avoid that eventuality with repellent. If you’re looking for another non-toxic, humane way to get rid of mice or rats, you could purchase an ultrasonic rodent repeller. This recipe will give you a rat control spray that once again scares away the rat population based on smell. Any rodent that gets a whiff of this mixture will head off in search of a new home far away from yours. Place the mothballs in a sturdy plastic bag and then crush them using a hammer. For the next step, transfer the crushed mothballs into a spray bottle and fill it with water. Finally, pour in the dish detergent and shake to mix well. Spray this natural mouse repellent anywhere inside or outside the house where you detect signs of rat activity, or in any areas they may frequent. Be sure to pay attention to areas close to a food source, by any small gaps they may traveling through, or anywhere else that seems necessary. Plants are a pleasant natural mouse repellent that works on rats too. This method of keeping mice away is one of our favorites because it serves so many different functions. Plants can improve the aesthetic of your home and also doubles as pest control for other unwanted guests like insects and small animals. You can either bring potted plants inside or plant them outside to keep mice out of your garden and away from the exterior of your home. By keeping rats off your property entirely, they’ll have no way to sneak inside. If you aren’t having success with these gentler rat removal methods, then you might have to resort to rat traps. There are humane mouse trap options, such as catch-and-release traps, but there are also traps that serve as home remedies to kill rats. Keep in mind that a small mouse trap will not be effective against rats, as they are so much larger. Whether you choose a traditional snap trap or a glue trap, you’ll need one large enough to stop a rat. Glue traps have an adhesive surface with bait on top that entices rats to step on the sticky trap, getting stuck. Most rats will die of starvation or suffocation on the trap, but it is possible to release the rat if desired if it’s still alive when you check the trap. The best way to eliminate a rodent problem is by being proactive and minimizing the chances of unwanted pests getting in your home in the first place. Keep your house clean, remove or securely hide food sources like pet food or leftovers, and fill in holes and cracks with caulk. Another effective material to use when filling in small gaps or holes is steel wool. If you’ve spotted an entry point in your wall, create a barrier with steel wool, as it is more challenging for rats to nibble through compared to other materials. Once you clear the rat infestation from your home, it’s essential to do a thorough cleaning with a bleach and water mixture to keep yourself protected from diseases. To avoid future problems, continue with some of these natural rat repellent techniques. 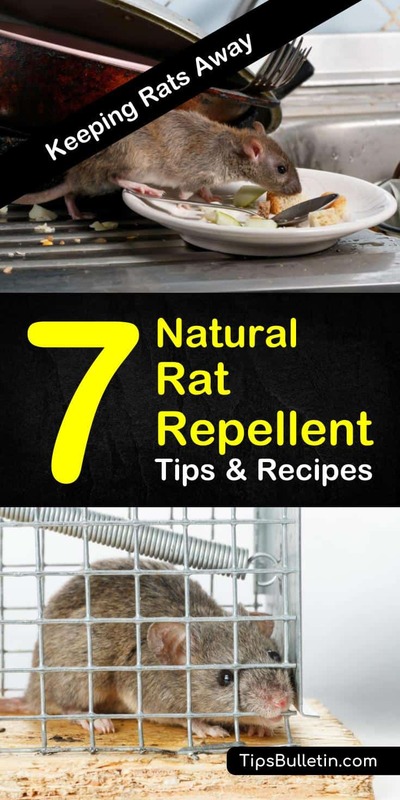 If you found these rat control tips useful, then share these natural rodent solutions on Facebook and Pinterest.